This is how you enter into JetSpot! For all the customers, until and unless, you login to this page, you wont be able to access to the internet. We got few calls, asking if there is a way to bypass this login system and keep it AUTO LOGIN all the time. And the answer is NO. 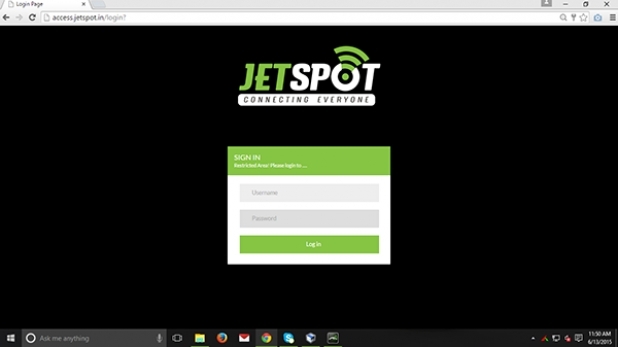 The system is developed to this way to give you a secure internet experience. This way, no can one hack into your internet account or use your account. Lets say, you are using a wireless router, to which our roof top device ethernet cord is connected and the POE device. And you are someone who wants to keep his internet ALWAYS ON, then DONOT switch off your Wireless router. You may switch off your desktop, PC, laptop, phone or tablet, but the router should not be SWITCHED OFF. This way, your internet stays online all the time, and you dont have to login everything you switch on your PC or laptop. But if the router is switched off or there is a voltage fluctuation at your end, then the router automatically gets restarted. In that case, the login screen will again come up and you have to login to access the internet.